Imagine my surprise this week to see an image that I created on Australian national television! This week the unfortunately popular A Current Affair featured a rare interview with legendary television producer Reg Grundy. Mr Grundy started his TV career hosting game shows in the 1950s, but moved into production of TV dramas and game shows, producing such renowned shows as Sons & Daughters, Prisoner and Neighbours (to name just a tiny sample of international recognised titles). In 1976 Reg Grundy Productions made the TV special The Best Of ABBA, and was also awarded with the licence to produce ABBA merchandise – all those t-shirts, socks, bubble gum cards, jigsaw puzzles, posters, etc. In 1977 Grundy co-produced ABBA – The Movie. 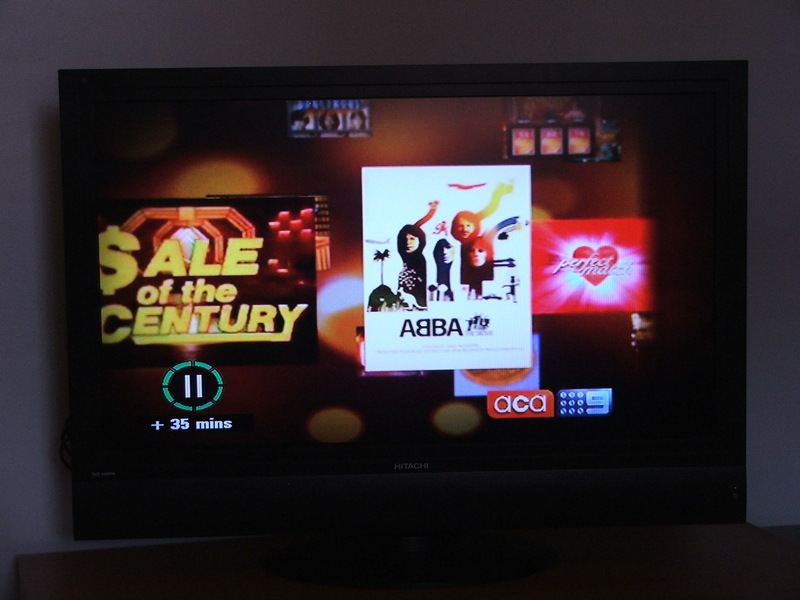 During a montage of images depicted Grundy’s many successful productions up popped an image for ABBA – The Movie that I created for my website The ABBA Phenomenon in Australia. It’s easy to recognise the image from the colouring, the placement – it’s a colour representation of the black & white newspaper ad, it was never rendered in colour – and the watermarked name of the website can be faintly made out in the top left corner. My image has been copied across the internet – on Wikipedia it is used to represent the ABBA – The Movie poster. See my original image here. The full interview can be seen here. Fans of the sound of ABBA music on vinyl records will soon have the chance to hear brand new pressings with the release of a new nine disc box set, ABBA – The Vinyls. ABBA – The Vinyls contains ABBA’s eight studio albums released between 1973 and 1981, with original sleeves and labels, including inner sleeves, as conceived by ABBA and Polar Music. This means that Ring Ring and Waterloo will contain the Swedish and English versions of their respective title tracks, Ring Ring will not include ‘She’s My Kind Of Girl’, and none will feature any bonus tracks. The ninth disc, ABBA Tracks, contains ABBA’s five non-album single A-sides, with five other non-album tracks on the B-side, “personally selected by Benny Andersson”, which probably really means that he approved them from a list of the dozen or so songs that were not on ABBA’s eight albums. ABBA Tracks sees the first ever vinyl release of the 1980 outtake ‘Put On Your White Sombrero’. All songs are being remastered from the original album tapes. Previous vinyl reissues in 2001 and 2008 used tapes remastered for CD. The first 2,000 people who order the box set before September 25 2010 will have their names printed in the box set’s booklet. ABBA – The Vinyls will be a strictly limited edition, scheduled for release on December 6 2010. It can be ordered now for Europe, USA, UK and the rest of the world. Read more about the box set at Carl Magnus Palm.com.